Along with Robin Hood, one of the other infamous renegades of Western literature is a Scottish general, seized with pride and ambition, who decides to murder his king and take his place on the throne. This is Shakespeare's Macbeth, treasonous war hero, and he's unique among this month's renegade characters in that he's not a noble outlaw, but rather a figure of treachery, chaos, and self-destruction. He's been played on film by Sam Worthington, among others, but that's not the version I bothered with... the Macbeth I saw was Toshiro Mifune in Akira Kurosawa's Throne of Blood. 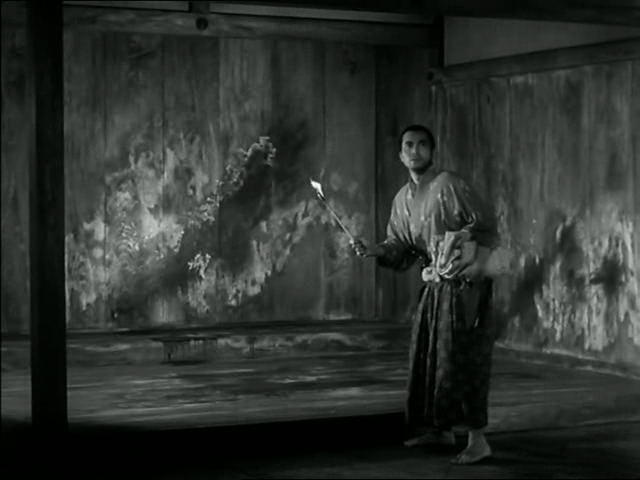 It's worth looking at what it might mean to be a "renegade" for Kurosawa in Japan, as opposed to Shakespeare in Scotland. Going back through the Elizabethan viewpoint on the feudal system, obviously the hierarchies are strong, and loyalty to kin is a powerful force. However, presumably, even in this ancient era of Western history, the importance of individualism and self-reliance was already forming... Shakespeare's time was, after all, the age of exploration and mercantilism, shortly following the Protestant reformation and the progressive rule of King Henry VIII (aka Jonathan Rhys Myers). Displaced into feudal Japan, Macbeth has extra punctuation on the themes of loyalty and honor. Nobody was more bound to their lord than the samurai, the great retainer of ancient Japan, who staked his life on his service to his lord. There's no way to quantify the difference between the Eastern and Western sensibilities, but it's fair to assume that for Washizu, this inner conflict is deeply-rooted. The Great Lord isn't just at the top of a political ladder -- he's a focal point for the society's ideology, its spirituality, and its whole familial structure... and themes of disgrace shudder under the surface of the whole bloody affair, from the haunted death-chamber of Fujimaki ("this is dog's blood") to the unsettling ambivalence of Washizu's soldiers, whose loyalties are tested in the final minutes of his short reign. 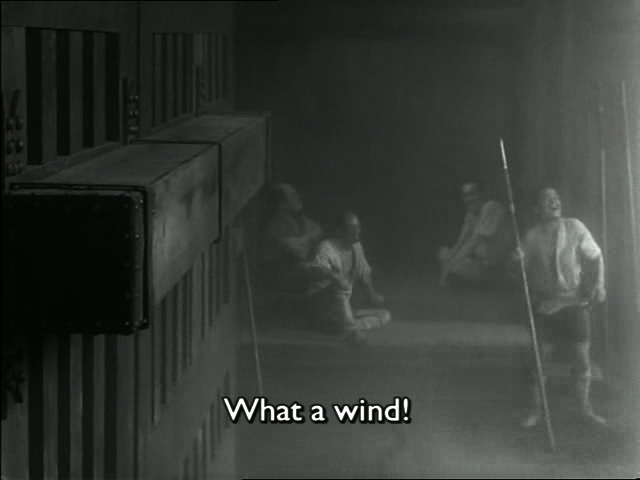 The politics of Throne of Blood are sweeping, and Washizu's inner conflict is severe -- however, it doesn't have the stormy turmoil of Macbeth, partly because we never hear any soliloquies from the treasonous main character. In fact, Throne of Blood simply doesn't feel as violent as Macbeth, despite a great deal of viciousness, assassination, and warfare. It feels more harmonious, as a whole, than the bard's masterpiece, and to what extent this is an effect of the Noh influence, I can't say. To my uneducated eyes, it's the result of rhythm and tone, and to a presence that infects the setting from the forest journey onward: the presence of the evil spirit, puppetmaster to Washizu's intrigue and anxiety. In accordance, the whole film seems obtuse and haunted (as opposed to fierce and uncontrollable, as Macbeth felt in the reading). The presence of that forest spirit hangs over the affair, speaking through animals and manifesting as different sorts of presences at different times: the chilling echo of a traitor in a bloody chamber, the sad, silent ghost of a friend betrayed, late to a lords' dinner. 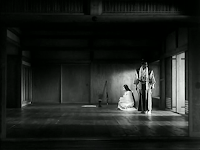 Even in the minimalist ballets of implied intrigue and control between lord and lady Washizu, there's something watching. Perhaps it's us, the omniscent eye, giving a perilous meaning to the events that unfold. I'd give this theory a chance: perhaps the viewers are the evil spirit, and our expectation is driving the plot's sinister, inevitable machinations. Perhaps fate is not so much predestined by Washizu's personality, nor enforced by the invisible hand of the kami, but rather propelled by our own demands for bloody resolution. 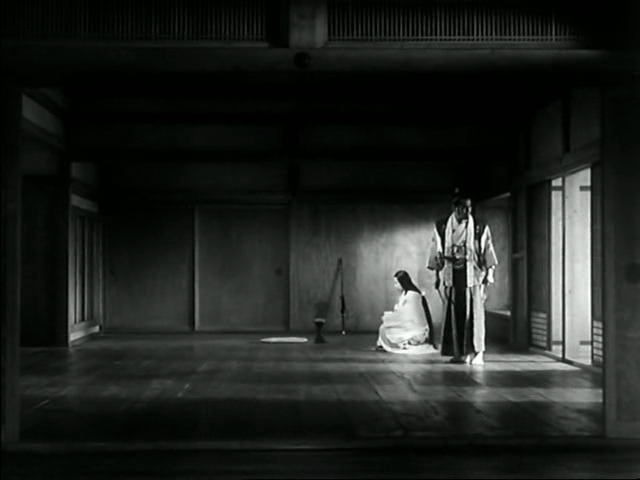 This feeling of order and inevitability, the dark clouds of fate gathering from the moment the prophecy is uttered, is partly because of a lack of soliloquy, but it's probably more because every scene of Throne of Blood is so perfectly constructed, and so pregnant with meaning. 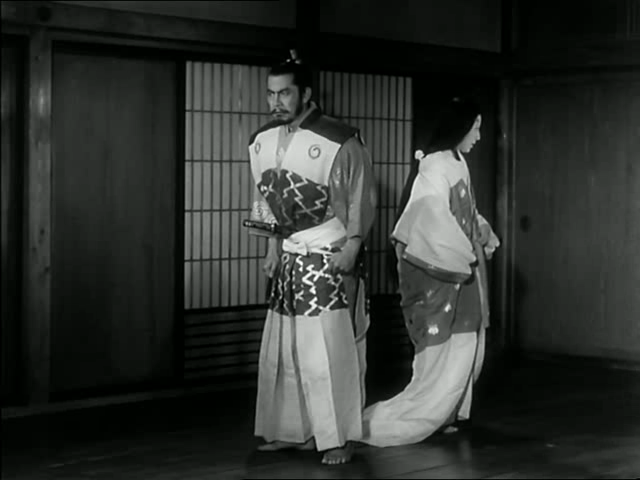 Indeed, one of the contextual effects lacking in Throne of Blood, that gives it such a sense of purpose, is an indication of an everyday life outside the intrigues of the main characters. The castle, the North Garrison, and even the fields at times... the sites for conversation, routine, and employment... frequently seem empty, providing sparse stages purpose-built for putting ambition and uncertainty on display. Has anyone noticed that when the other castle-dwellers are shown, they always seem to be loitering, sitting in one place, gazing around a courtyard, barely conversant? They don't seem to be at home in their own residences, and like us, they seem to be waiting for some sudden development, some turn of fortune or deferred sign of fate. The peasants outside are less "folk" and more like ghosts of everyday life, just crossing into this mysterious spirit-world for a moment when the Great Lord rides past them through the field. 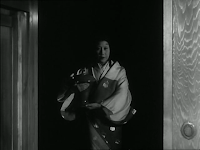 Perhaps in Throne of Blood, the characters have already crossed into the spirit world, so they all feel like unwelcome guests, in a hurry to do their violent duties and get the hell out. 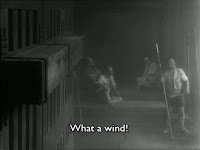 And in the midst of this haunted feudal Japan, we have a great deal of action that ultimately seems to center on Washizu, victim of the voices around him. He is the transgressor, the scapegoat for the sin of disloyalty, which is a fire lit within him by an evil forest spirit, and then fanned by a scheming spouse. He supplies the fuel for this inevitable flame to burn him to ashes, and when he finally falls, it's at the hands of his own army, assembled from his victims' soldiers -- a roundabout method of suicide, for sure, but still, in a certain way, it's death by his own hand. 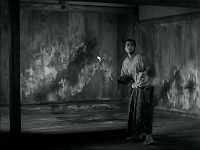 I wish I had more original analysis to provide, but one of the triumphs of Throne of Blood is the fact that so much of the film is felt, rather than sensed, understood, and deconstructed. Other critics have talked about the use of editing to create confusion, or the narrative symmetry of the film, layered over visual symmetry in a number of important scenes, or about the lines of force (horizontal, vertical, and diagonal) that signal shifts in tone and temprament. However, these factors are fairly insignificant in comparison with the whole effect, which is vast, empty, and uneasy. This is a rare occasion where it's hard for me to analyze the experience, which is so intuitive and complex, so I'll leave you with a recommendation to go see this film if you haven't, and if you have, maybe even see it again. And I'll also leave you with Washizu's Renegade Profile, in accordance with our monthly theme.